Save extra money with exclusive app-only Cashback offers, deals and discounts. Earn upto 5000 cashback this month! Get access to exclusive features that are only available on the mobile app. We keep introducing new app-only features to make it more intuitive & user-friendly. Scan QR codes to pay at lifestyle & fashion outlets, restaurants, local kirana store, etc., & avail benefits of several deals & offers. 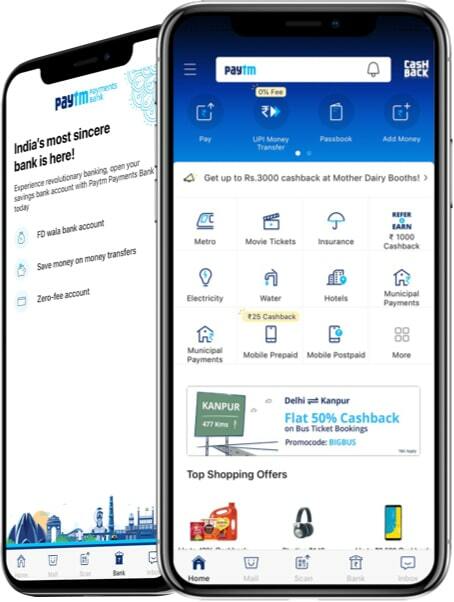 How to download Paytm App? It will take a few minutes to download the free of cost Paytm app from your respective app stores. Downloading the app depends on the type of operating system of your mobile. You can get the app for both, Android and iOS based smartphones. For Apple users, go to the App Store and tap the magnifying glass on the bottom right of your screen. Search for Paytm app and tap ‘Get’ to proceed with the Paytm app installation on your iOS device. Compatibility- Requires iOS 10.0 or up. Compatible with iPhone, iPad and iPod touch..
For Android users, go to the Play Store and search for Paytm app & tap ‘Install’ to download the app on your Android device. Compatibility- Requires Android 4.1 and up. Compatible with Android smartphone and tablet. Get it now & enjoy the delightful app features & innovative technology! How to get started after downloading the Paytm app? After installing the app, sign up and get ready to explore the brilliant features of Paytm app intended to make lives easier & better! We have ‘Help Videos’ and 24/7 customer care connectivity to ensure you don’t find any difficulty in using our user-friendly app. Keep a tab on all your wallet transactions with our revamped Paytm Passbook & view all your orders in ‘My Orders’ section. Pay through Paytm and experience flawless cashless payments!